Oh my little Claire bear....how did you get to be 3 months old already? The last 3 months are somewhat blurry for mommy but we have turned a corner this month and I am coming out of my new mommy non-sleeping haze. You are such a joy! I feel so blessed that you are ours. You and your sister make me one happy lady and I truly believe that God has given me two of the most amazing babies ever. So happy. You smile all the time. I did your photo shoot today in about 5 minutes and you smiled for the entire thing. You are just a happy little baby. So sweet and cuddly. You love to be held. LOVE IT. Nothing makes you more content than being close to me. I hope you stay that way for a long while to come. In love with your big sister. And the feeling is mutual. She loves you so much and you are the first thing she thinks about in the morning. Everyday when I go in to get her she says "wanna say hi baby" which means she wants to say hi to you. She now cries when I put you down for a nap. It is the sweetest thing. I can't wait to see you grow up together! You are laughing. You laughed for the first time yesterday and it is just the best sound. It's amazing the things that mommy will do to get you to laugh. You are a big girl. You started out as a tiny little nugget and now you are a chunk. You are eating 6 ounces of formula about every 4 hours during the day. You seem to be outgrowing your reflux because you have been spitting up a lot less the last few days. You are sleeping between 8-10 hours at night. You usually go to bed between 9 and 10 and wake up between 6 and 7. You take two naps a day now and are really getting on a schedule. It makes life so much easier for mommy. Everyone said I wouldn't be blessed with another good sleeper and you are proving them wrong because you like to sleep just as much as your sister does! You've got rolls. Tons of them. I love them! You are so squishy and cute! A lot of people say you look like your sister. Here is a picture for comparison. This is you, today at 3 months. This is your sister at 3 months. I see some similarities (like your noses) but I for one think you look like mommy. 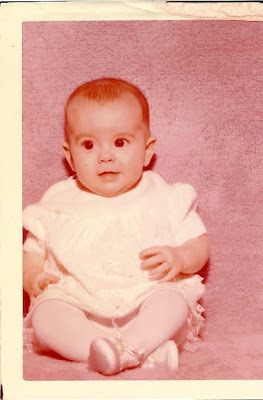 Here is a picture of me at 3 months. You are such a sweet baby. We love you so much! Happy 3 months Claire! She does look like you, except that you were a tiny little thing. No rolls!!! They both have your hair line. They're both adorable, happy and healthy and we love them to pieces!! they are twins i tell you, twins! and super cute too!. still lovin' that darlin chair too! Holy Moly! She is a doll! I just want to kiss her cheeks! You two look an awful lot alike! and I agree with above comment! LEEEYYYYOVEEEEE (love) the chair! Happy 3 months! She is BEAUTIFUL! So adorable! I can't believe she is 3 months already! Love the chunks! And I must say that I do believe that she is a Little Jenn! XOXO to Claire and Julianne! She is so incredibly cute! yes! very strong resemblance! and what a rockin' chair! When comparing their 3 month pictures, I immediately noticed how much bigger her eyes look than Julianne's...and then I saw your picture and know exactly where they come from-I love them! I was shopping the other day and heard a baby laugh and thought "I'm ready to hear that again"! She is so adorable! 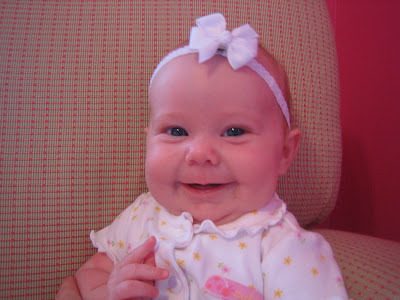 Thanks for sharing all the pics, they are so cute...especially when she is laughing...priceless.